One day while browsing the Asus Global website, I saw something which I thought was odd; an AMD Athlon64 socket 754 nForce4 motherboard with support for PCI Express... the chipset was released a while ago but apparently socket 754/nForce4 motherboards have only just recently become available. The board in question was the ASUS K8N4-E Deluxe, making it a potentially attractive upgrade option. At the same time, it also breathes new life into socket 754 systems. Today, PCStats will be looking at the new Asus K8N4-E Deluxe motherboard. It's so new that it's not even up on Asus's North American website. Based around the nForce4 chipset, this motherboard supports Socket 754 AMD Athlon64 or Sempron processors. It's memory slots will accommodate up to 3GB of single channel DDR memory. Graphics come courtesy of a standard PCI Express x16 slot, which is the key selling point as far as we're concerned. Onboard goodies consist of an extra Serial ATA/RAID controller, a 7.1-channel audio codec, IEEE 1394a Firewire and Gigabit LAN. Despite all the integrated features the K8N4-E Deluxe shouldn't break the bank at about $142 CDN ($115 US). Expansion needs are cared for with an unusual arrangement of three PCIe x1 slots and three conventional PCI slots. 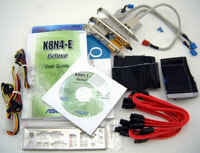 A total of eight SATA 1 devices are supported, as well as four IDE devices. The Asus K8N4-E Deluxe is a full size ATX motherboard, in a tan brown coloured PCB, with a nice assortment of audio options like optical and composite SPDIF-out. The layout of components and sockets on the K8N4-E Deluxe is good, so working with this board is a pleasure. All the headers are labelled, and enthusiasts will appreciate the five well placed fan headers too. Three of them are free at any given time, while one is used with the CPU heatsink, and the other by the chipset heatsink fan. With hard drive prices falling through the roof, even the average computer user may have more than one HDD. Myself, I have four Serial ATA HDDs and I definitely appreciate the additional Silicon Image Sil3114 Serial ATA controller on the K8N4-E Deluxe. I'm a JBOD type of guy, but if you wanted to use RAID the Sil3114 is capable of running RAID modes 0, 1 0+1 and 5. One area where Asus is a cut above everyone else is its awesome users manuals. Looking at the one that accompanies the K8N4-E Deluxe, I thought it would be multi-language since it was so thick, but to my surprise the whole thing was in English. Asus covers everything from installing memory modules to BIOS settings and it even has a detailed description on how to setup RAID on both nVIDIA and Silicon Image controllers! Those of you with current Socket 754 Athlon64 systems will probably notice that the K8N4-E Deluxe has the new 24 pin ATX 2.0 connector on the PCB, but not to worry. The motherboard will still work with older 20 pin ATX power supplies assuming they can deliver enough power for the system. About the only thing I have to complain about is the chipset fan/heatsink that came on this board. The fan is (apparently) notorious for failing. In fact, during the testing the K8N4-E Deluxe the fan stopped working more than once... twice.... thrice... etc, etc.! In my main rig at home I use an A8N-SLI DLX and the chipset fan has completely seized up after only a month. Search around the various computer forums and you'll no doubt get an earful about this issue.